CBS’s 60 Minutes has recently found that wood boards, laminate and flooring from Lumber Liquidators have excess levels for Formaldehyde. For a full review please click here. Formaldehyde is a toxic material that can kill bacteria and viruses as well as damage human cells. Many pressed boards, laminant and hardwood floors includes the use of adding certain derivitives of Formaldehyde to them in their manufacturing process. These derivitives still emit unpolymerized Formaldehyde gas into the air for several years which can cause many health issues. Food manufacturers sometimes add Formaldehyde to foods such as fish, meats, milk, noodles meats, etc to extend its shelf-life. Many ordinary foods naturally contain small amounts of Formaldehyde however, excess Formaldehyde has been reported in many foods. Although adding formaldehyde to foods is forbidden in many countries, some manufacturers still add it in particular if the food is expected to stay un-refrigerated for a while. Consumers of foods need to know if they contain excessive and dangerous amounts of formaldehyde. Inspectors of food need to know if formaldehyde was added purposely and illegally to the food. 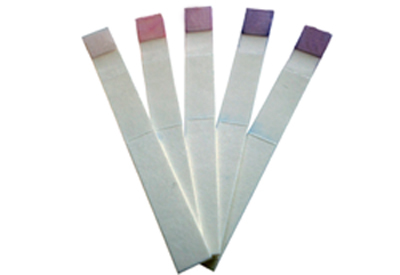 Each dosimeter is worn on an employee’s collar or pocket or in a particular exposure area. The dosimeter can be checked at regular intervals throughout the day to ensure exposure levels comply with government regulations. 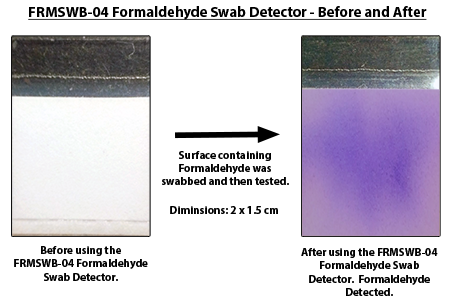 The color on the center of the dosimeter can be visually compared to the reference colors pre-printed on the cards to semi-quantitatively estimate exposure. Electronic readers are also available which allow for quantitative determination and record-keeping of exposure. For pricing and additional information on these detectors, please Request a Quote and our representatives will contact you with additional information.